Jonathan Abrams (second from left), Manager, Gershow Recycling, presents a check to Lou Giordano (center), President, Patchogue Lions Club, at the organization’s 18th annual “Christmas in June” event at Boomer’s Family Fun Center in Medford on June 21. 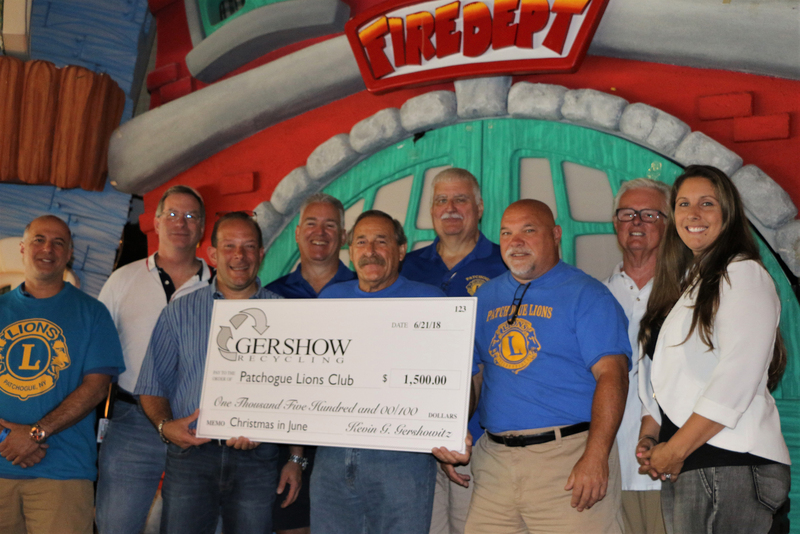 Also pictured (front row, left to right): Bob Bromberg and Dan King, Officers, Patchogue Lions Club, and Laura Kowalik, General Manager, Boomer’s Family Fun Center. Back row (l-r): Peter Feehan, Bob Silver, Bob Schwarz and Bob Foray, Officers, Patchogue Lions Club. The Patchogue Lions Club held its eighteenth annual “Christmas in June” event on Thursday, June 21 at Boomer’s Family Fun Center in Medford. For the thirteenth consecutive year, as part of its ongoing community service, Gershow Recycling sponsored the event by donating $1,500. Approximately 150 school children from seven elementary schools in the Patchogue-Medford School District were chosen to participate in this year’s event by their respective principals. Since the Patchogue Lions Club has started “Christmas in June,” more than 1,900 children have participated in this fun-filled event. Children were treated to lunch and then given full access for several hours to attractions, including rides, go-carts, wall climbing, bumper boats, and arcade games.